Bell’s Let’s Talk Day is coming up in a few months on January 30th, 2019 and it’s set to surpass one billion messages sent in support of mental health in Canada. More importantly, Bell is well on track to raise more than $100 million dollars CAD since 2011 when it first began. Bell donates five cents per text, call or social media interactions on Let’s Talk day. 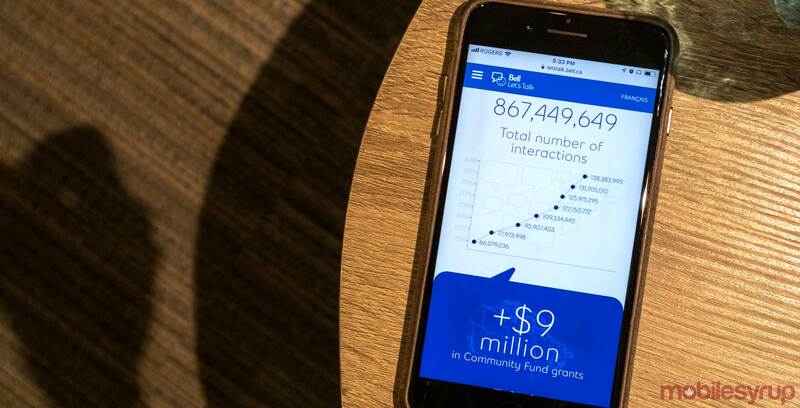 Since last year’s Let’s Talk Day the company has raised $93,423,628.80 CAD with a total of 867,449,649 interactions. So, it only needs to donate just over six and a half million dollars this year to reach the 100 million dollar goal. Which is very possible considering 2018 users sent 138,383,995 messages which resulted in $6,919,199.75 worth of donations. To take action and you can use #BellLetsTalk hashtag on Twitter or watch Bell’s Let’s Talk video on Twitter, Facebook or Instagram. Alternatively, sending Snapchats with the Bell’s event filter will also cause a donation. As always, every call and text made by Bell Customers will result in a five cent donation too.